Analysing a mixture of earth samples and meteorites, scientists from the University of Bristol have shed new light on the sequence of events that led to the creation of the planets Earth and Mars. Planets grow by a process of accretion — a gradual accumulation of additional material — in which they collisionally combine with their neighbours. This is often a chaotic process and material gets lost as well as gained. Massive planetary bodies impacting at several kilometres per second generate substantial heat which, in turn, produces magma oceans and temporary atmospheres of vaporised rock. Before planets get to approximately the size of Mars, gravitational attraction is too weak to hold onto this inclement silicate atmosphere. Dr Remco Hin from the University of Bristol’s School of Earth Sciences, led the research which is published today in Nature. He said: “We have provided evidence that such a sequence of events occurred in the formation of the Earth and Mars, using high precision measurements of their magnesium isotope compositions. “Magnesium isotope ratios change as a result of silicate vapour loss, which preferentially contains the lighter isotopes. In this way, we estimated that more than 40 per cent of the Earth’s mass was lost during its construction. The research was carried out in an effort to resolve a decades long debate in Earth and planetary sciences about the origin of distinctive, volatile poor compositions of planets. Did this result from processes that acted in the mixture of gas and dust in the nebula of the earliest solar system or is it consequence of their violent growth? Researchers analysed samples of the Earth together with meteorites from Mars and the asteroid Vesta, using a new technique to get higher quality (more accurate and more precise) measurements of magnesium isotope ratios than previously obtained. This slipshod construction process results in other chemical changes during growth that generate the unique chemical characteristics of Earth. 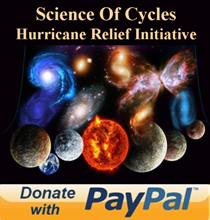 Dr Hin added: “Our work changes our views on how planets attain their physical and chemical characteristics. “While it was previously known that building planets is a violent process and that the compositions of planets such as Earth are distinct, it was not clear that these features were linked. 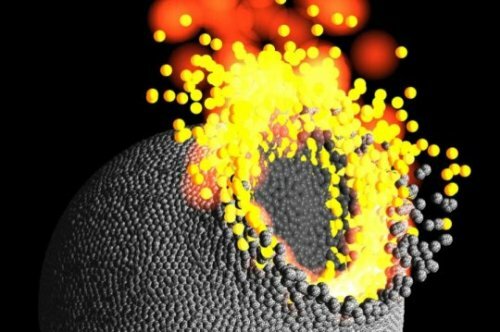 “We now show that vapour loss during the high energy collisions of planetary accretion has a profound effect on a planet’s composition. An international team of researchers has successfully used a super-computer simulation to recreate the formation of a massive black hole from supersonic gas streams left over from the Big Bang. Their study, published in this week’s Science, shows this black hole could be the source of the birth and development of the largest and oldest super-massive black holes recorded in our Universe. “This is significant progress. The origin of the monstrous black holes has been a long-standing mystery and now we have a solution to it,” said author and Kavli Institute for the Physics and Mathematics of the Universe (Kavli IPMU) Principal Investigator Naoki Yoshida. Recent discoveries of these super-massive black holes located 13 billion light years away, corresponding to when the universe was just five per cent of its present age, pose a serious challenge to the theory of black hole formation and evolution. The physical mechanisms that form black holes and drive their growth are poorly understood. Theoretical studies have suggested these black holes formed from remnants of the first generation of stars, or from a direct gravitational collapse of a massive primordial gas cloud. However, these theories either have difficulty in forming super-massive black holes fast enough, or require very particular conditions. Yoshida and JSPS Overseas Research Fellow Shingo Hirano, currently at the University of Texas at Austin, identified a promising physical process through which a massive black hole could form fast enough. The key was incorporating the effect of supersonic gas motions with respect to dark matter. 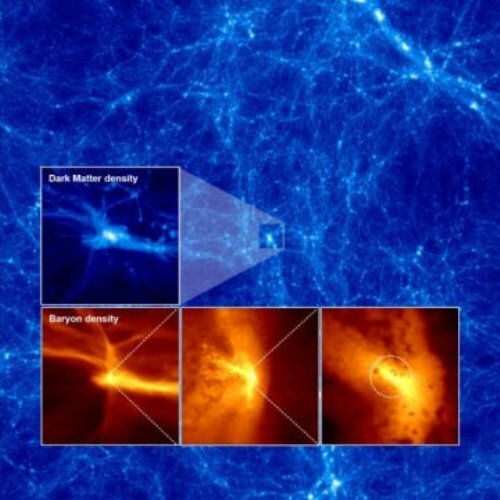 The team’s super-computer simulations showed a massive clump of dark matter had formed when the universe was 100 million years old. Supersonic gas streams generated by the Big Bang were caught by dark matter to form a dense, turbulent gas cloud. Inside, a protostar started to form, and because the surrounding gas provided more than enough material for it to feed on, the star was able to grow extremely big in a short amount of time without releasing a lot of radiation. “Once reaching the mass of 34,000 times that of our Sun, the star collapsed by its own gravity, leaving a massive black hole. These massive black holes born in the early universe continued to grow and merge together to become a supermassive black hole,” said Yoshida. “The number density of massive black holes is derived to be approximately one per a volume of three billion light-years on a side — remarkably close to the observed number density of supermassive black holes,” said Hirano. The result from this study will be important for future research into the growth of massive black holes. Especially with the increased number of black hole observations in the far universe that are expected to be made when NASA’s James Webb Space Telescope is launched next year. NASA’s Hubble Space Telescope has photographed the farthest active inbound comet ever seen, at a whopping distance of 1.5 billion miles from the Sun (beyond Saturn’s orbit). Slightly warmed by the remote Sun, it has already begun to develop an 80,000-mile-wide fuzzy cloud of dust, called a coma, enveloping a tiny, solid nucleus of frozen gas and dust. These observations represent the earliest signs of activity ever seen from a comet entering the solar system’s planetary zone for the first time. 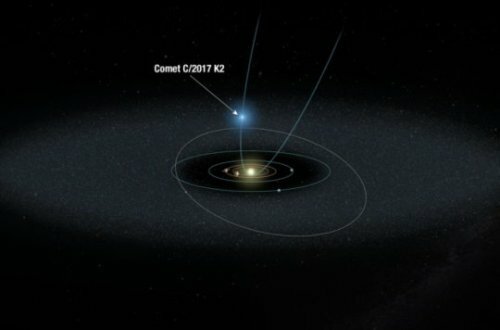 The comet, called C/2017 K2 (PANSTARRS) or “K2,” has been travelling for millions of years from its home in the frigid outer reaches of the solar system, where the temperature is about minus 440 degrees Fahrenheit. The comet’s orbit indicates that it came from the Oort Cloud, a spherical region almost a light-year in diameter and thought to contain hundreds of billions of comets. Comets are the icy leftovers from the formation of the solar system 4.6 billion years ago and therefore pristine in icy composition. Based on the Hubble observations of K2’s coma, Jewitt suggests that sunlight is heating frozen volatile gases — such as oxygen, nitrogen, carbon dioxide, and carbon monoxide — that coat the comet’s frigid surface. These icy volatiles lift off from the comet and release dust, forming the coma. Past studies of the composition of comets near the Sun have revealed the same mixture of volatile ices. K2 was discovered in May 2017 by the Panoramic Survey Telescope and Rapid Response System (Pan-STARRS) in Hawaii, a survey project of NASA’s Near-Earth Object Observations Program. Jewitt used Hubble’s Wide Field Camera 3 at the end of June to take a closer look at the icy visitor. Hubble’s sharp “eye” revealed the extent of the coma and also helped Jewitt estimate the size of the nucleus — less than 12 miles across — though the tenuous coma is 10 Earth diameters across. This vast coma must have formed when the comet was even farther away from the Sun. Digging through archival images, Jewitt’s team uncovered views of K2 and its fuzzy coma taken in 2013 by the Canada-France-Hawaii Telescope (CFHT) in Hawaii. But the object was then so faint that no one noticed it. But, curiously, the Hubble images do not show a tail flowing from K2, which is a signature of comets. The absence of such a feature indicates that particles lifting off the comet are too large for radiation pressure from the Sun to sweep them back into a tail. Jewitt said that NASA’s James Webb Space Telescope, an infrared observatory scheduled to launch in 2018, could measure the heat from the nucleus, which would give astronomers a more accurate estimate of its size. The team’s results will appear in the September 28 issue of The Astrophysical Journal Letters. The Hubble Space Telescope is a project of international cooperation between NASA and ESA (European Space Agency). NASA’s Goddard Space Flight Center in Greenbelt, Maryland, manages the telescope. The Space Telescope Science Institute (STScI) in Baltimore, Maryland, conducts Hubble science operations. STScI is operated for NASA by the Association of Universities for Research in Astronomy, Inc., in Washington, D.C. This dawn-dusk asymmetry is created by a combination of Mercury’s long day, in comparison to its year, and the fact that many meteroids in the solar system travel around the Sun in the direction opposite the planets. 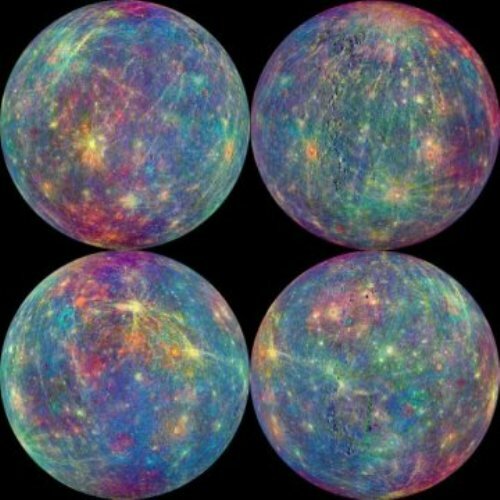 Because Mercury rotates so slowly — once every 58 Earth days, compared to a Mercury year, a complete trip around the Sun, lasting only 88 Earth days — the part of the planet at dawn spends a disproportionately long time in the path of one of the solar system’s primary populations of micrometeoroids. This population, called retrograde meteoroids, orbits the Sun in the direction opposite the planets and comprises pieces from disintegrated long-period comets. These retrograde meteroids are traveling against the flow of planetary traffic in our solar system, so their collisions with planets — Mercury, in this case — hit much harder than if they were traveling in the same direction. Jupiter-family comets, which are primarily influenced by our largest planet’s gravity, have a relatively short orbit of less than 20 years. These comets are thought to be small pieces of objects originating in the Kuiper Belt, where Pluto orbits. The other contributor, Halley-type comets, have a longer orbit lasting upwards of 200 years. They come from the Oort Cloud, the most distant objects of our solar system — more than a thousand times farther from the Sun than Earth. Scientists taking a new look at older data from NASA’s longest-operating Mars orbiter have discovered evidence of significant hydration near the Martian equator — a mysterious signature in a region of the Red Planet where planetary scientists figure ice shouldn’t exist. Jack Wilson, a post-doctoral researcher at the Johns Hopkins University Applied Physics Laboratory in Laurel, Maryland, led a team that reprocessed data collected from 2002 to 2009 by the neutron spectrometer instrument on NASA’s Mars Odyssey spacecraft. 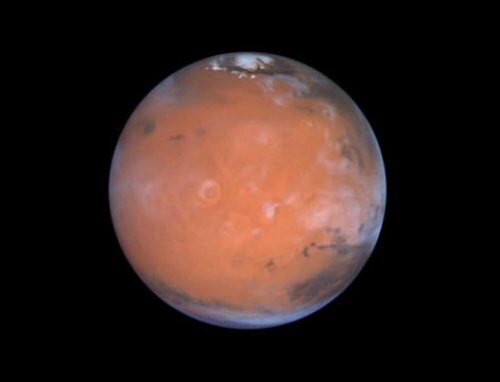 In bringing the lower-resolution compositional data into sharper focus, the scientists spotted unexpectedly high amounts of hydrogen — which at high latitudes is a sign of buried water ice — around sections of the Martian equator. An accessible supply of water ice near the equator would be of interest in planning astronaut exploration of Mars. The amount of delivered mass needed for human exploration could be greatly reduced by using Martian natural resources for a water supply and as raw material for producing hydrogen fuel. The neutron spectrometer can’t directly detect water, but by measuring neutrons, it can help scientists calculate the abundance of hydrogen — and infer the presence of water or other hydrogen-bearing substances. Mars Odyssey’s first major discovery, in 2002, was abundant hydrogen just beneath the surface at high latitudes. In 2008, NASA’s Phoenix Mars Lander confirmed that the hydrogen was in the form of water ice. But at lower latitudes on Mars, water ice is not thought to be thermodynamically stable at any depth. The traces of excess hydrogen that Odyssey’s original data showed at lower latitudes were initially explained as hydrated minerals, which other spacecraft and instruments have since observed. Wilson’s team concentrated on those equatorial areas, particularly with a 600-mile (1,000-kilometer) stretch of loose, easily erodible material between the northern lowlands and southern highlands along the Medusae Fossae Formation. Radar-sounding scans of the area have suggested the presence of low-density volcanic deposits or water ice below the surface, “but if the detected hydrogen were buried ice within the top meter of the surface, there would be more than would fit into pore space in soil,” Wilson said. The radar data came from both the Shallow Radar on NASA’s Mars Reconnaissance Orbiter and the Mars Advanced Radar for Subsurface and Ionospheric Sounding on the European Space Agency’s Mars Express orbiter and would be consistent with no subsurface water ice near the equator. How water ice could be preserved there is a mystery. A leading theory suggests an ice and dust mixture from the polar areas could be cycled through the atmosphere when Mars’ axial tilt was larger than it is today. But those conditions last occurred hundreds of thousands to millions of years ago. Water ice isn’t expected to be stable at any depth in that area today, Wilson said, and any ice deposited there should be long gone. Additional protection might come from a cover of dust and a hardened “duricrust” that traps the humidity below the surface, but this is unlikely to prevent ice loss over timescales of the axial tilt cycles. Wilson led the research while at Durham University in the U.K. His team — which includes members from NASA Ames Research Center, the Planetary Science Institute and the Research Institute in Astrophysics and Planetology — published its findings this summer in the journal Icarus. Where do cosmic rays come from? Solving a 50-year old mystery, a collaboration of researchers has discovered it is much farther than the Milky Way. In an paper published in the scientific journal ‘Science’, the Pierre Auger Collaboration has definitively answered the question of whether cosmic particles had originated from outside the Milky Way Galaxy. Their research notes that studying the distribution of the cosmic ray arrival directions is the first step in determining where the extragalactic particles originate. 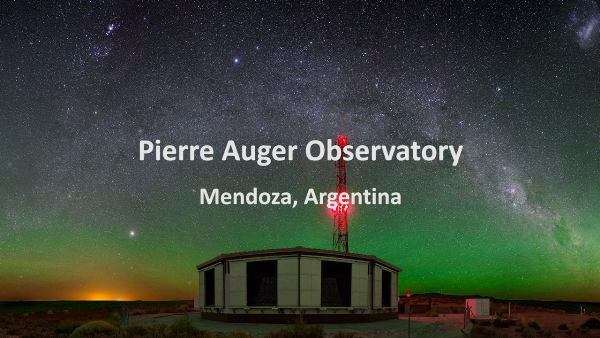 The collaborating scientists were able to make their recordings using the largest cosmic ray observatory ever built, the Pierre Auger Observatory in Argentina. Included in this collaboration are David Nitz and Brian Fick, professors of physics at Michigan Technological University. “We are now considerably closer to solving the mystery of where and how these extraordinary particles are created, a question of great interest to astrophysicists,” says Karl-Heinz Kampert, a professor at the University of Wuppertal in Germany and spokesperson for the Auger Collaboration, which involves more than 400 scientists from 18 countries. 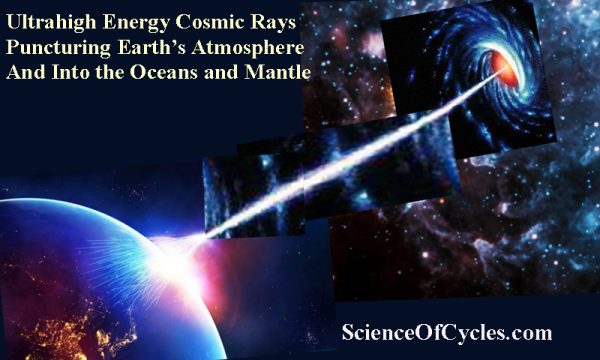 Cosmic rays are the nuclei of elements from hydrogen to iron. Studying them gives scientists a way to study matter from outside our solar system – and now, outside our galaxy. Cosmic rays help us understand the composition of galaxies and the processes that occur to accelerate the nuclei to nearly the speed of light. By studying cosmic rays, scientists may come to understand what mechanisms create the nuclei. To put it simply, understanding cosmic rays and where they originate can help us answer fundamental questions about the origins of the universe, our galaxy and ourselves. 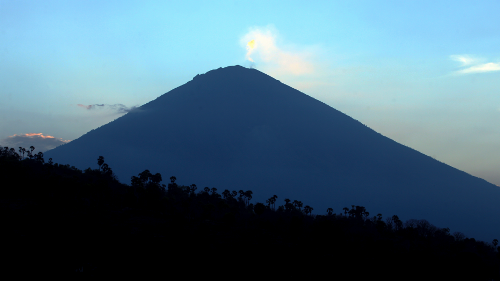 BALI, Indonesia – Experts say a suddenly active volcano on the Indonesian tourist island of Bali is more likely to erupt than not. But because every volcano has its own unique characteristics, scientists can’t predict when that will be with total certainty. It could erupt suddenly or continue for weeks at its current menacing level of seismic activity. WHAT’S LED TO ERUPTION WARNINGS? The slow movement of the tectonic plates that make up the planet’s surface carries massive quantities of rock deep into the earth, where they melt. As this molten magma rises, pressure increases inside a sealed chamber beneath the mountain until it explodes. The type of magma that feeds Mount Agung traps more gas, which tends to produce larger eruptions. It’s the rising volume of magma that is causing hundreds of tremors being recorded daily around the mountain. “The volcano is bulging, causing a large number of small cracks to form and the earth to vibrate,” said David Boutelier, a geologist and expert on plate tectonics at Australia’s University of Newcastle. HOW SOON COULD IT ERUPT? Disaster officials said instruments recorded more than 800 volcanic earthquakes on Wednesday. Many of the quakes in the past week have been strong enough to be felt by people in the surrounding region. In theory, the current level of activity could go on for some time without an eruption. It is difficult to predict because each volcano behaves differently. “It could continue for the next few days or weeks, but an eruption could also happen any time given its condition is very critical,” said Gede Swantika, head of volcanology at Indonesia’s Center for Volcanology and Geological Disaster Mitigation. Heather Handley, an earth sciences specialist at Sydney’s Macquarie University, said Agung’s last eruption in 1963 was preceded by earthquakes, small ash eruptions and lava flow. “It is hard to know for sure what will happen this time,” she said. WHAT ARE THE CHANCES IT WILL ERUPT? Authorities raised the volcano’s alert status to the highest level on Sept. 15 and announced a no-go zone that extends up to 12 kilometers (7.5 miles) from the crater. More than 130,000 people have fled, including some who live farther away. “We could say that the chance of an eruption is very high, above 50 percent,” said Swantika. Entering the exclusion zone would be extraordinarily risky. “I would not go now. The activity is too high and the risk much too large,” Boutelier said. The pyroclastic flow, a rush of hot gas, ash and other volcanic material, would “kill everyone in its path in a few seconds,” he added. COULD THE VOLANCO SUDDENLY GO QUIET AGAIN? It’s possible the volcano could calm back down, but that is unlikely without pressure being released in some way. Handley said there were signs of activity such as gas releases and earthquakes in 1989 and swelling of the volcano between 2007 and 2009 without any subsequent eruptions. But this time around, the buildup of activity is much more significant, she said.